Those words ring in my ears like sweet bells all night as I listen to giggles, chuckles and outright fits of giddiness. These women, the Apples group at my church, know how to have a good time. 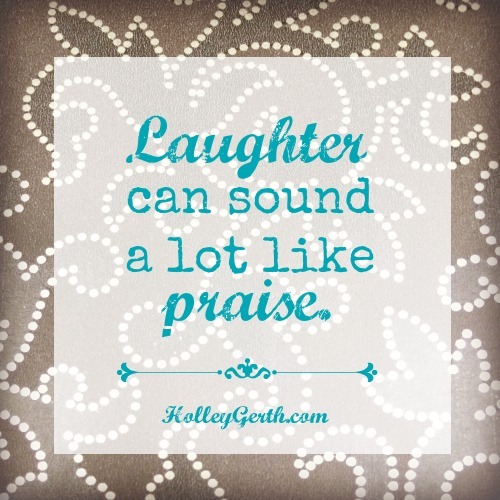 And as I reflect on it later I realize that, yes, their laughter sure sounded a lot like praise. So, friend, let’s give God the joyful praises of our laughter this season. We can laugh when we burn the pie. Laugh when we sit around the table with family. Laugh when we open that crazy present. Laugh when we are messy and imperfect and have our this-is-not-the-most-wonderful-time-of-the-year moments. Laugh when we think about how God is full of surprises like sending His son as a baby in a manger. May our Lord Jesus Christ enriches your moments full of love and joy! Holley, I know this isn’t the first time you have reminded us of the beauty of laughter! How timely this is that we may raise our laughter up in praise and thanksgiving for this blessed gift of Joy! May our hearts be filled with laughter and joy to His Glory at Christmastime and always! Rejoice! What a treasured gift you are, Holley! I love the encouragement and simple common sense truth you share. Laughter does the heart good like a medicine. And indeed it sounds ring through heaven with joy and praise. Merry Christmas! grace is hard when the world expects perfection. thank you Holley for freeing and reminding me that its okay to not take myself too seriously. I love the image your post brings to my mind of giggling and chuckling and outright fits of giddiness and hilarity. Makes me think of a choir singing in harmony (!!!) or birds on a summer morning. I’m one of those who has felt, for MANY years, that seriousness was sacred. I used to worry when my little sons, years ago, would laugh and cut up so much. (Now I think it was their way of defending themselves against my everlasting seriousness) Now, when I hear children giggling and being noisy, I thrill at the sound and long to tell their Mom, “Don’t worry, be thankful they are healthy. Their energy and exuberance is GOOD!” Even complaining and bickering children bring a smile to my lips and a peal of joy to my heart. My husband’s humor makes me laugh. He’s disabled and often feels awful, but his jokes ring the bells for me. I’m entering the “golden years” and am more observant of those even older than I. I love it when I see them laughing over some little thing…..they know how to preserve the moment and do the healthiest practice God has given us…..laughter. Apples? Just curious why you call your group the Apple group. What a wonderful (not your typical) Christmas post! I love this! It’s so true. I often think that God didn’t HAVE to create laughter. He clearly had a reason to why he created it. 🙂 Blessings on your Christmas! Wonderful article, Holley! I agree with what you and several others said about your article, “God is good and all is well even when life is hard.” Such a true statement; especially when often during Christmas things go wrong, like the crust on a pie coming out a bit too brown or when struggling with wrapping paper and it tears on the wrong side or is uneven. Thank you Holley for sharing with us life’s imperfections and that it’s O.K. to be imperfect. In fact, sometimes, you can reach someone who is difficult by laughing at imperfections and just being happy with who we are. Laughter as praise, laughter over burnt pie… girl, you never cease to make me see life differently. Or to have more joy. Love you! Thank you all for being here with me! 🙂 I hope you each experience a Christmas full of laughter. It is such a beautiful sound, is it not?